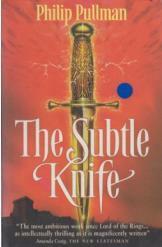 The Subtle Knife Philip Pullman Sci Fi. Book is in good condition, all pages intact. A boy named Will is on the run after killing a man. There he meets a girl named Lyra. Together these kids will face dangerous creatures, some of whom are fighting for possession of a mysterious artifact. The second book of the His Dark Materials series.